A couple of weeks ago my daughter in law had a garage sale. This set of ceramic, faux crazed set of country candle holders did not sell. I took them home to upcycle. First I removed the homespun ribbon and metal dragonflies. 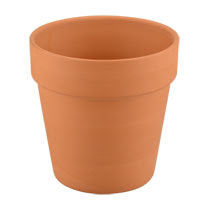 I purchased a two pack of 3 1/2" terracotta pots at Dollar Tree. I painted the Dollar Tree pots with Americana Decor Chalky Finish Paint in "Primitive", a gray shade that I really love. The paint covered the pots in just one coat. Then I applied a coat of DecoArt's clear wax. I painted the dragonflies in a light green shade with other craft paint that I had on hand. Next, I glued the pots to the tops of the candle holders with E6000 glue, placed a heavy book on the top of each pot, and let them dry overnight. Lastly I drilled a hole in the metal dragonflies and tied them on with jute, and added faux greenery to the pots. *I received Chalky Finish Paint and wax at no cost from DecoArt, but all opinions about the paint are my own! This project was almost free! Almost free and really cute to boot! Very cute - perfect for summer! Very cute makeover!!! I love Americana Decor Chalky Finish Paint in "Primitive". I just painted a few things with it this week.